The University set up a series of tagboards to aggregate all social media references to the University and specific events. These boards will incorporate all posts by the Universities as well as the general public, providing you with the widest range of updates and information. Each tagboard is based on the use of hashtags. 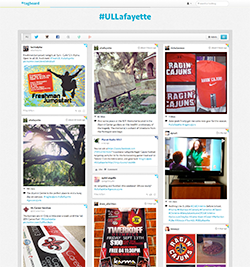 Only postings submitted on official UL Lafayette social media accounts are endorsed by the University.